Knitting machines or hand knitting - which is better? When you imagine somebody knitting, you usually picture them using their hands, using two needles, a length of yarn, and not really much else. But what about all those shop-bought sweaters? Where do they come from? Because it’s hard to imagine rows and rows of humans on a production line, clickety-clacking away. You’re absolutely right, in that they aren’t made the traditional way, otherwise how could they be made so cheaply? A knitting machine is an absolute must for clothing companies. But, in fact, anyone can own a knitting machine. Why would you choose to use a knitting machine? Traditionalists will say that using a knitting machine is sacrilege. However, there are some obvious benefits to choosing knitting machines over hand knitting. Let’s look at some of them, so you can decide for yourself. Speed is the essence – This is obviously one of the biggest benefits. When it comes to knitting scarves, sweaters, blankets, or other items for your family and home, using a knitting machine will mean you finish your projects much faster. If you’re thinking of starting a knitting business or want to make some money knitting, speed is of the essence. No slipped stitches or crooked cables – Using a knitting machine means your efficiency will improve, along with your accuracy. Many machines use programmed patterns, which leave no room for human error. Lose your attention when hand knitting and you’ll be dropping stitches or knitting crooked cables till the cows come home. There will be far fewer mistakes if you’re using a machine. Are there any differences between hand and machine knitting? Before you take the plunge and change from hand knitting to machine, let’s point out some of the differences. Stitches aren’t created equal – Not all stitches are created the same with a machine, as they are with needles. There are even some that are impossible to recreate. Others are so tedious, it’s hardly worth the bother. Differences in gauge – The ideal scenario would be to choose a machine that allows you to change the position or size of the needles, to meet a different gauge. Unfortunately, many machines have needles locked in place, which means you can’t adapt for different gauges. What happens instead is several swatches have to be created, in order to determine the right one to use. Machine knitting requires far more preparation, but don’t be disheartened. Once you’ve got the hang of it you’re production line will be smoking hot. How does a knitting machine work? Knitting machines work by using a bed that consists of a series of latch hooks, There are usually between 150 and 200 needles, and this is what the yarn loops through. There is a carriage, or cam box that moves over the latch hook needles which causes them to move in the correct way to produce another stitch. There are various selection methods which help to tell the machine exactly what to do, and which stitch to make next. Punchcards were mostly used in the past, but most of these have been replaced by computer control. What are the different knitting machine types? Knitting machines designed for use in the home have been popular since the mid 1900s. There are plenty to choose from, but not every one functions and performs the same. On the whole, most knitting machines fall into the type called ‘Japanese’. There are several different brands, but most of them are similar and work in much the same way. The most usual differences are in the switches and levers. What they’re called and where they are does vary. The biggest dilemma you face when looking at different knitting machine types, is not the brand or manufacturer, but the gauge. What we’re talking about here is the size of the needles, and how close they are together. Both have a direct relationship to the size of yarn you can use. There isn’t a machine that can knit any kind of yarn. Although most are designed to handle a range of different ones. In the machine’s instruction booklet will be a page for technical specifications. The number of needles, along with their pitch in mm, will get a mention. However, a description of the gauge is better to look at, and this can be one of three. Standard gauge knitting machines – These are the most common. There are 200 needles, and the needle pitch is 4.5mm. They can be used to knit with a variety of yarns, and can be used to make some beautiful knitted clothing and sweaters. Not typically suitable for heavier knits such as a heavy ski sweater. 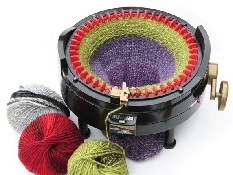 Bulky gauge knitting machines – These are designed to be used with worsted weight yarns, and create knitwear that looks like it’s been hand made. There are 114 needles and their pitch is 9mm. Also good for sport weight or bulky yarns. So if you’re planning on knitting the whole family heavy Christmas sweaters, this one is for you. Fine gauge knitting machines – These are for the finest yarns of all, and will produce very fine knit fabrics, much like those in your local sweater store. There is another type of machine called the mid-gauge. This type combines the best of both bulky and standard machines. However, many are not made to the highest standard and often feature plastic needle beds and fewer functions. However, they are still a great starting point, or perfect if knitting is really only a hobby.